"I feel like the gradual drip-feeding of the feather revolution (or whatever it is we're calling it) could result in another shift of public consciousness towards the amazing creatures we paleo-nerds are all familiar with, and I'd like to be a tiny part of that (hey, one raindrop raises the sea, right?)" ...Which is something that Ralph does acknowledge. 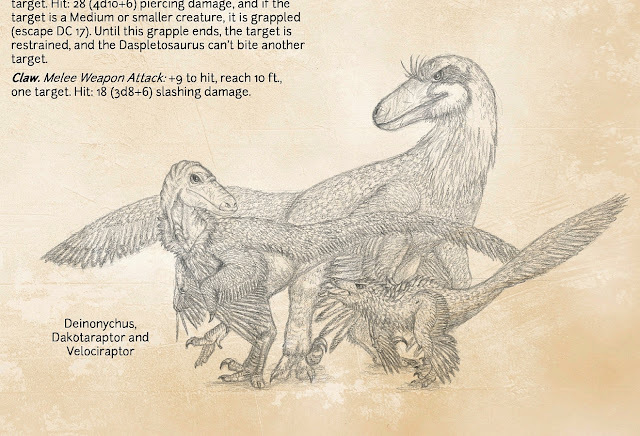 In some cases, he notes that "one particular reconstruction completely [dominates] my view of how the creature looked," acknowledging the Saurian Dakotaraptor (by RJ Palmer) as being "such an iconic design for a new species that I simply felt unable to top [it]". Consequently, Ralph's sports a lookalike head. 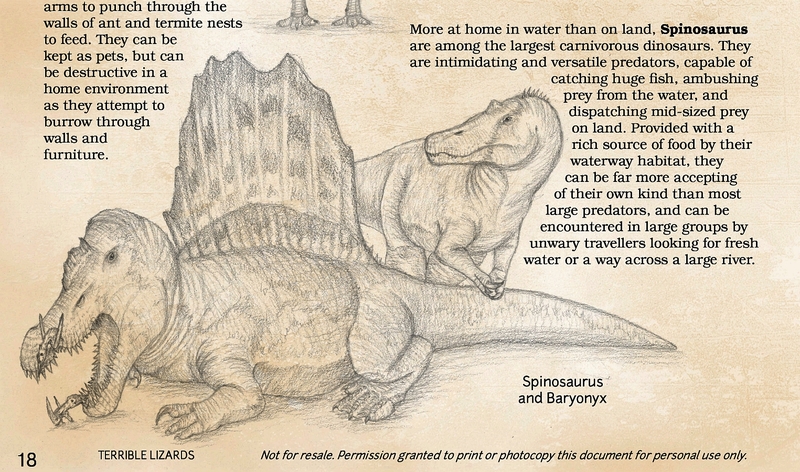 Elsewhere, the book features an Edmontonia that resembles the famous Tyrrell Museum model, and a very Wittonesque quad-launching Hatzegopteryx. Naturally, it's fine to be inspired by another artist's work, although I'd suggest that Ralph alter at least the head of the Dakotaraptor for any future revisions, as its distinctive appearance is a little distracting; much as I love Palmer's work, I'd hate for his Dakotaraptor to start becoming the ultimate reconstruction of the animal in artists' eyes, similar to Sibbick's work in the '90s. That aside, there is some very nice work in here. The animals are portrayed in a naturalistic light, resisting the urge to 'monsterise' them or pander to JP-inspired pop culture sensibilities. 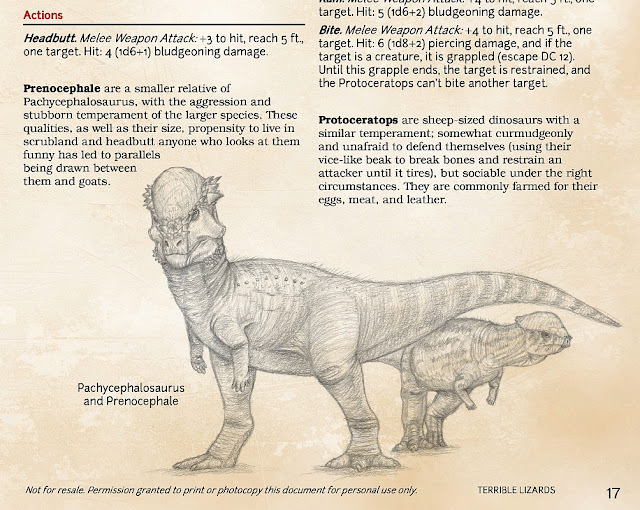 There's also a pleasing use of differing perspectives to add extra interest to the pieces, and difficult angles are notably pulled off well (one of my favourites is the Pachycephalosaurus pictured above) [EDIT: It's been brought to my attention on Facebook that said Pachycephalosaurus strongly resembles a piece by Fred Dierum, which it very much does. To be honest, that really isn't cool, and I'd urge it be removed or reworked to be less of a blatant copy.] Ralph mentions being "completely enamoured" with the work of our very own Natee, and one can certainly see the stylistic similarities - there's some skilled fine line work going on here. Having talked about the artwork so much, it would be remiss of me to not mention the text. Naturally, there is a certain amount of artistic and dramatic license here as far as the animals' behaviours go - in the end, this is a book describing creatures for a role-playing game. However, Ralph has attempted to stay close to a realistic view of what each animal might have been like as much as possible; again, this is in contrast with how they've been depicted in the past. 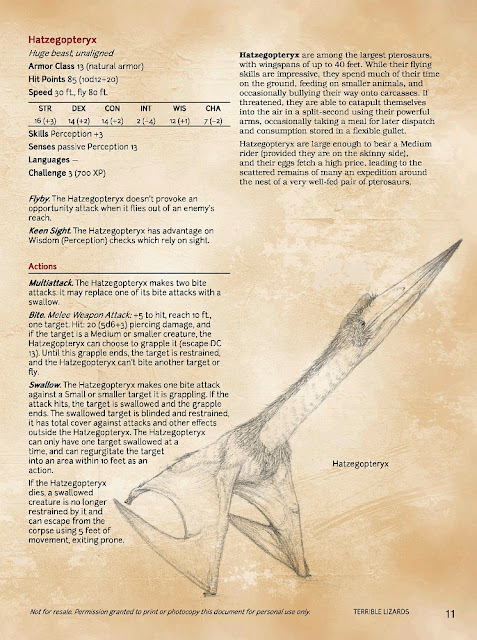 As such, dromaeosaurs are more about grappling and stabbing (inspired by Raptor Prey Restraint) than disembowelment-by-slashing. Elsewhere, tyrannosaurs are noted for their excellent sense of smell, and ornithomimosaurs have excellent eyesight. Frankly, even the wackier stuff (like weaponised lambeosaur bellows) isn't beyond what Bob Bakker has come up with in the past. 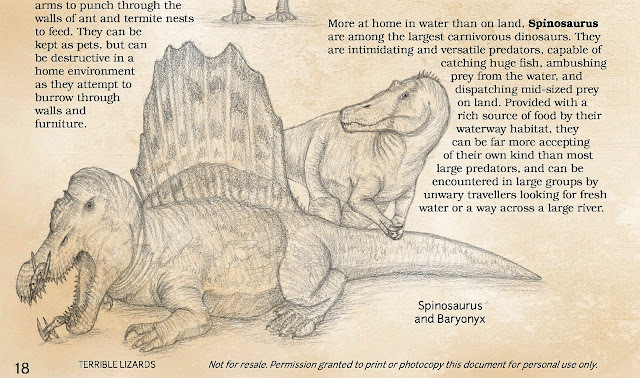 There's a fun element to the general descriptions, too, as they imagine how these animals might interact with a medieval-type human society. Happily, pterosaur riding is definitely on the cards; apparently, Hatzegopteryx are "large enough to bear a Medium rider (provided they are on the skinny side)". An incentive to be 'Mr Average Physique', there. There's a fine line to tread between realism and gaming enjoyment, and - with the caveat that I don't play D&D - Ralph seems to have struck a very good balance. A thoroughly decent effort has been made to ensure the animals reflect contemporary scientific understanding, while also retaining a certain amount of imaginative playfulness and a good sense of fun. Here's hoping that Ralph makes his illustrations bolder and brighter for any future revisions - he's certainly up to the job.